Google Smart Contact Lenses for Diabetics Patients is a great wearable health care electronic device to measure Glucose level which reads sugar level accurately from eye tears, without pain or perking. Google has officially acknowledged that its experimental project codenamed “Google X Lens” has entered into testing stage. Google X Lens commonly termed as Google Smart Contact Lenses are wearable pair of Contact Lenses for Diabetics patients with a more valuable purpose in health care compare to the Google Glass. The basic idea behind this Google Smart Contact Lens is to check Glucose level in eye water or tears and provide its measure reading on your smartphone through Android Apps. “Google X Labs” is research and development unit of the company, which works on long-term, risky new technology that may never become commercially successful but has the potential to change the way people live in drastic ways. The unit has already produced self-driving cars for blinds and connected eyewear called Google Glass. Brian Otis and Babak Parviz, the Google X Lens project co-founders, has worked together at the University of Washington and then joined Google X to work on Google Glass. Dr. Otis has been running a chip design research lab and has worked at Intel Corp and Agilent Technologies before coming to Google. Google has conducted “multiple studies” to test the comfort and functionality of the lens and explore how tear glucose correlates with blood glucose. In conjunction with other apps and sensors, in future this health care technology idea could eventually lead to a full fledged personal fitness monitoring or vitals monitoring system. We see Google move into healthcare as a major strategy, starting with a small eye-wear to eventually partnering with Electronic Medical Record (EMR) and HIT vendors to exchange user/patient healthcare data between the EMR/EHR and his/her Gmail account. Hence, providing a more effective substitute for the “Patient Portal”, an mandatory requirement for EMRs to secure Meaningful User Stage 2 certification, under Affordable Care Act (Obamacare). 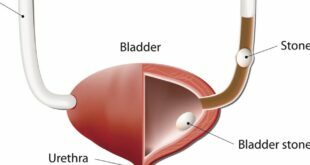 For diabetes patients its routinely to take out needles and start squirting a bit of blood to check their glucose levels, usually at least twice a day but sometimes more. One can imagine the inconvenience and embarrassment of this glucose testing method if one is in some social gathering or public place. 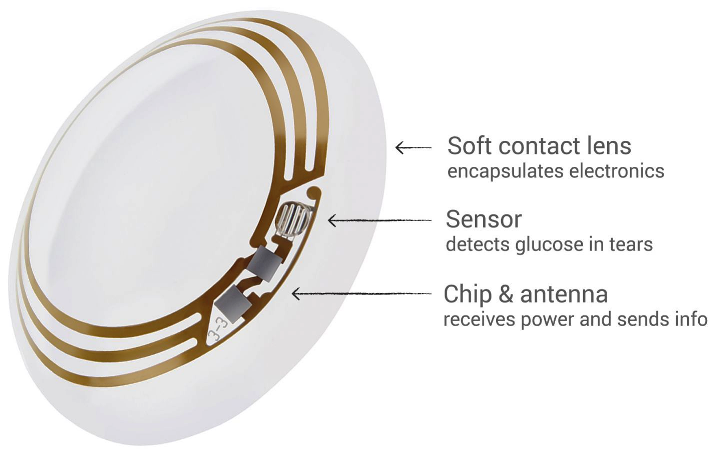 The miniaturized glucose sensors inside Google Smart Contact Lenses are so small they look like bits of glitter. 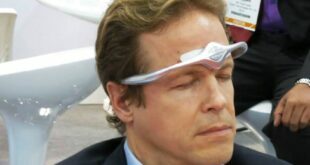 The sensors read the Glucose measure and transmit it through a micro wireless chip as thing as hair, both embedded between two layers of lens material, making this health care device a totally safe eye-wear. To add more value for chronic diabetic patient, the lens also includes a nano LED light to turn on as an indicator that glucose levels have gone dangerously wrong. Google has designed its own nano circuit mounting its on very thin, flexible, plastic-like film. The chip and a sensor are embedded between two layers of soft contact lens material. A tiny pinhole in the lens lets tear fluid from the surface of the eye to seep into the glucose sensor. It’s still early days for this technology, but we’ve completed multiple clinical research studies which are helping to refine our prototype, We hope this could someday lead to a new way for people with diabetes to manage their disease. Google has already started looking for partners and app-developers which could ensure that the levels and parameters are seen both by the patients & their respective doctors. Google has already started working with partners and app-developers to ensure that the levels and parameters are seen both by the patients & their respective doctors with ability to show per second real-time values. A Google representative has also confirmed that the company has filed formal Application for the US Food and Drug Administration (FDA) approval, to bring the product to the market, which essentially means the new Google Smart Contact Lenses Release Date can be expected in the mid 2015.
International Diabetes Federation has welcomed Google entry into this sector, as every 10th person in the world will have diabetes by 2035. Currently, Diabetics Patients need to monitor their glucose levels regularly by perking drops of blood out for testing glucose. Due to pain and other health risks involved, in the past, researchers have been looking for non-invasive ways to check glucose through sweat, saliva and urine. Abbott and Dexcom are also working separately on non-invasive glucose test technology to eliminate fingersticks through a more accurate, factory-calibrated sensors with ability to sends data straight to the smartphone. The system requires bio-chips to be placed under skin and are currently under FDA review. As we have mentioned in Healthcare IT trends 2014, many global firms have been looking to expand in the wearable technology sector, seen by many as a key growth area in the coming years. The wearable technology sector is expected to grow by between $10bn and $50bn (£6bn and £31bn) in the future 5 years. Within the sector, many firms are specifically targeting the junction of health care technology and wearable technology, for the reason that health care technology industry is far more stable and promised compared to fluid and fluctuating fashion wear technology industry.